Our Six month Blessing (Pirith) Ceremony is almost coming to an end. During the last five months the venerable monks recited Navaguna Paritta, Ratnamali Paritta, Seevali Paritta numerous times a day and Maha Pirita twice a day to send blessings for a large number of people around the world for their peace and happiness. Our Blessing Ceremony is the first one of such a caliber in the history of Buddhism in the United States. Even in the recent Buddhist History of Asia to recite three powerful Parittas continuously for six month is extremely rare. The venerable monks have worked hard and exceeded the number of targeted recitation of the three Parittas. Our original target was to recite 10,000 times each of the three Parittas to make a total of 30,000. We are happy to say that by the end of the ceremony the number of recitations will be 120,000. During this period Maha Pirita is being recited 358 times. In the Buddhist culture reciting Maha Piritha even once is believed to be highly effective in bringing many benefits. Since we have accomplished an outstanding success at our temple, we are planning to celebrate the completion of the Blessing Ceremony on June 28, 2015 at 10.30 am. All of you are invited to this great meritorious deed. There are about 15 monks and Temple members are preparing the dana. If you wish please bring your favorite vegetarian dish for dana and to share with others. 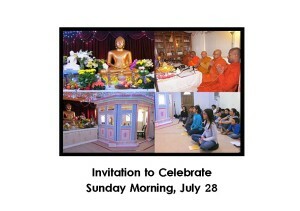 The program also includes a Dhamma Talk/Discussion. All sponsors of the blessing ceremony will receive 20 ml of highly blessed water to take home. If you wish to sponsor the Blessing Ceremony on any day before the 28th or to offerpirikara (appreciation gift) to one of the monks at the celebration, please contact the temple at 916 371 8535. Only the first fifteen callers will be able to offer this special pirikara. All others are encouraged to prepare your own pirikara if you wish. Wishing all of you good health and happiness with the blessings of the Triple Gem. Previous Article Nepal Earthquake Relief / Need Your HELP !! !